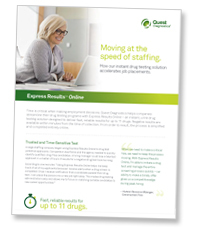 Express Results™ Online allows you to select a test panel from up to 11 different drugs. After placing an online order, you can track the test throughout the screening process. Results are reported electronically the instant they become available, typically within minutes of the collection. Faster employment decisions are only a click away.